A petite beauty who packs a punch. 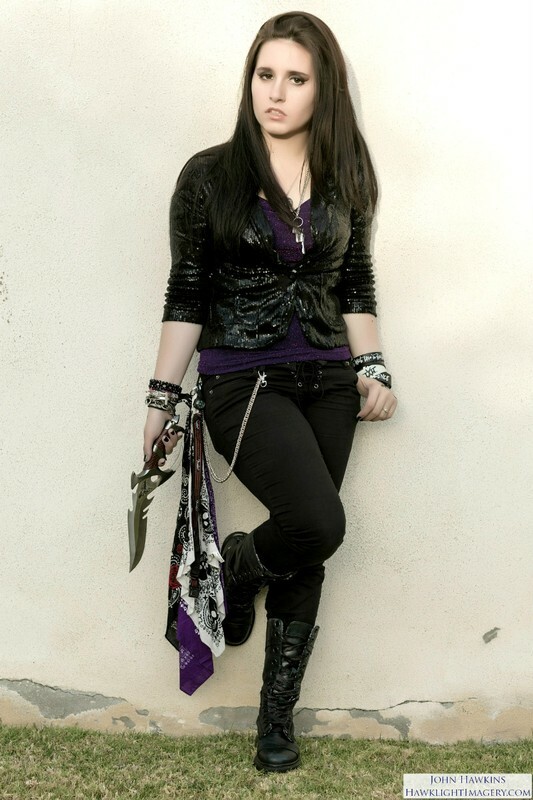 Moxy Anne is an 18-year old rocker from Southern California who plays it loud and doesn’t hold back. Blessed with her mother’s Italian genes, she’s got raven hair, a big heart, and an even bigger voice. With classical training and a thirst for hard rock, she brings it, with both energy and skill. She is a fan of anything loud and a student of those who do more than just stand on the stage and look at their instruments. In 2009 Moxy joined the Southern California Children’s Chorus, which gave her opportunities to sing at the Long Beach Symphony Orchestra, the Orange County Pacific Chorale, and the 55th Anniversary Celebration at Disneyland. In 2013 she was awarded the Chorus’ coveted Director’s Award. This choir later allowed her opportunities to sing on live and on recordings with acts such as Aerosmith, Our Last Night, Jackie Evancho, and several movie scores/soundtracks. Generation Sin, Kemical Kill), Brandon Wolfe (Kemical Kill, Generation Sin), along with drummer Conner Marone (Take No Glory and Autograph). At age 14, she decided to branch out and begin her solo music career. She released her first single, “Stand Up”, on December 31, 2011, and it was this song that became the official 2012 Pro-Life Day of Silent Solidarity track and the theme song for Stand True. She joined an all-girl group, The Raveyns (formed by Jason Land and Gina Shock of the Go-Go's), where she met her best friend Sydney Ellen and the swiftly became as close as any two sisters could be, bonding as the years went by over music and working together. They were single-minded together and when Moxy decided to form a band in 2013, Sydney was the first call she made - and Syd gladly accepted. Since then, the two have headed MXI together as a power team. Some like to call them "the reincarnation of Anne and Nancy Wilson!" Moxy is inspired by the great artists of yesteryears. The 70's, 80's and 90's are what she spends her days drawing creativity from, pulling from bands such as Motley Crue, Led Zeppelin, Aerosmith, and Janis Joplin (to name a few). Her unique vocal ability and range caught the attention of Orange Country Production and writing team “The Assassination” Daniel Martin and Corey Bush (written for Demi Lovato, Selena Gomez, Mumford and Sons, etc.) and Dani Thompson, A&R for DNT Entertainment in 2013, and she partnered with them to begin writing and recording the music from the early days of MXI. After forming Moxy and The Influence with Sydney Ellen in late 2013, she worked with several other producers and studios (Paul Dexter, Daniel Thomas Barsoe, Paul Miner, etc) to record more original and cover material. Moxy is a Freshman at Azusa Pacific University, and spends her days dedicated to music, inspiration, and making others smile - all while focusing on her dedicated work in Moxy and The Influence.